I’ve been working on another knitted item for my eventual clothing collection — this time it’s a skirt. The overall shape is quite modern, but the bottom boasts a knitted-on lace border adapted from a shawl pattern in Weldon’s Practical Knitter, circa 1885. 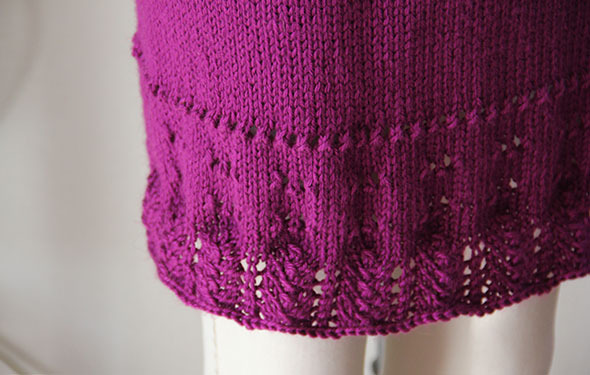 Most lace edgings are knitted lengthwise, then sewn onto the piece. It’s rare to find one knitted into the edge, and even more rare to find one knitted down, rather than up. The original directions suggested knitting a square shawl, then using double-pointed needles to pick up stitches all around the shawl to knit the edging. Those must have been some serious double-pointed needles!